La STPO - "Le Combat Occulté"
My introduction to French band La STPO was an earlier Beta-lactam release that reissued an EP from 1986 and an LP from 1990 (see AI #18). La STPO's music is firmly in the Rock in Opposition mold of bands like Etron Fou LeLoublan, Zut en Fou Roughe, Aksak Maboul, Henry Cow and like minded others. 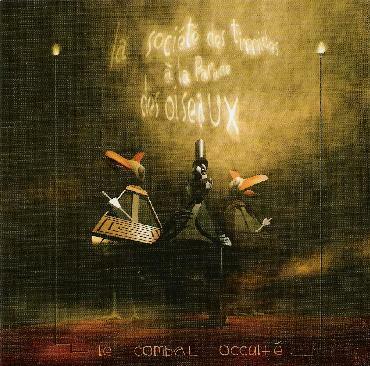 Le Combat Occulté is a 22 track retrospective of music from the 1980's and 1990's, with the focus being less on compiling a "best of" package and instead attempting to showcase the band's more exploratory works. I should add for those who are interested that La STPO stands for La Societe Des Timides A La Parade Des Oiseaux, which translates to "the shy people at the bird parade". It's a wonder this band wasn't more well known as they incorporate the best of any RIO fans favorite stylings, though the abrasive rocking punk elements help give the band more of their own identity. Throughout the album we're treated to a variety of music, usually within the same song, from Henry Cow styled dissonance, to punked out free-jazz, abstract free-improv, and avant-classical rock. A punk rock version of Etron Fou is what a lot of these songs remind me of. The singer certainly rivals Guigou Chenevier for crazed fervor. The musicianship is outstanding and when the band really gets cranked up they hug the curves at harrowing but impeccable speeds. There are lots of guitar heavy tracks and the raw grinding chords and screaming anguished licks inject an energy and attitude into the music that fans of Nick Didkovsky (Dr Nerve) and Roger Trigeaux (Present, Univers Zero) will love. There are also several less purely rocking tracks that are reminiscent of Fred Frith's collaborations with Etron Fou, and other fascinating music that is abstract but still song-oriented and simply unclassifiable. Descriptions are ultimately difficult with music like this, though fans of Etron Fou, Dr. Nerve and Henry Cow are guaranteed to be thrilled with La STPO. For more information you can visit the Beta-lactam Ring Records label web site at: http://www.blrrecords.com.